With a wandering by Alexandru Balgiu from ‘The New Rational Typewriting’ and contributions from Paul Bailey, Angélique Buisson, Loraine Furter, Valérian Goalec, Aurélien Mole, Museum of Museum, Ghazaal Vojdani and Eleanor Vonne Brown. The event is based on Open Books most recent chapter, Volume E. It acts as a 3D Mock up of the chapter. A final draft before it goes to print. A live edit. A rehearsal. 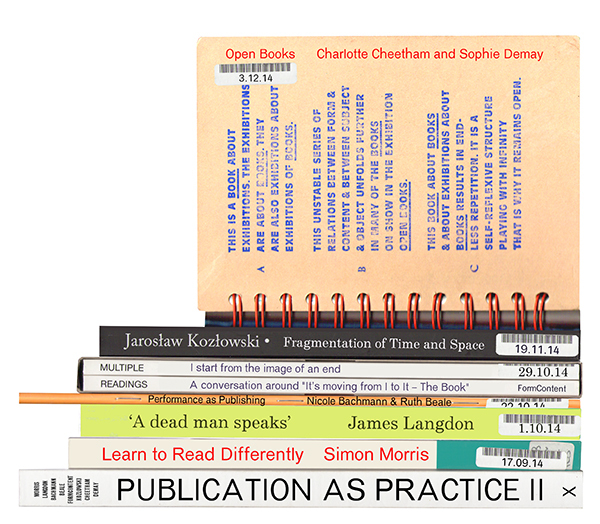 Since 2010, the project Open Books has been playing with the idea of spaces: the space of the book – its representation as an object – and the book in the space – the systems of its display in exhibitions. This event lies precisely in between these spaces, at their crossroads, margins and intervals. A second edition of Open Books that includes volume E, is to be released in early 2015 and published by Hato Press.